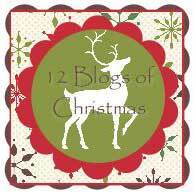 Hello and welcome to the 12 Blogs of Christmas. I love Vannessa's projects and I am so very excited to do the hop myself, if you have not done this before let me tell you you are in for a treat. Is all very easy, each of the 12 participants has worked very hard to provide a Christmas inspired project or two and each one will link to someone in the chain that you will be visiting next, so you will basically end up visiting all those fabulous blogs in the chain. Make sure you leave a comment as well this way we will all be able to come and visit you back. Ok so I have a video for you to watch and this cute little project will make the perfect gift for Christmas. I have designed these for the Stamp With Us Winter Online classes and I also made a few for an organized swap at Convention . I hope you will have a go at making thse they really are quick to make. I love your project, how clever to do something so different. I love them, and will give them a try. Thank you for the inspiration. Great idea Monica, they look absolutely gorgeous! I love these sachets Mon - was very sad that I wasn't in your group for the 3d swaps! Will just have to make my own - looking forward to it! 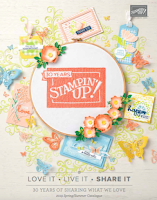 WOW - I always thought Stampin` Up! things can only be used for paperwork ... Lovely this idea! Thanks so much for sharing how to make those Monica! I can't wait to give it a try myself!!! What a great project Monica. So very pretty, and such a lovely gift idea. Thanks so much for sharing with us. Monica, Thanks for joining in hunni! I love the sachets and have to make some now! loved these on the su winter classes but have to confess not made them- yet! These are fabulous Monica. Will be giving these a go. Monica I have TWICE forgotten to order the tape to make these - Doh! Hopefully I will remember to add it to my next workshop order so I can make some for Christmas. They are so lovely. These are great for those extra little gifts! What a great way to use the twill tape. So talented....... they are fantastic Monica. Love them. so nice to put a vioce to your photo too. Enjoy the rest of the evening. TFS. These are beautiful honey. Cant wait to have a go! Love them. Might be a good project to do with some sewing friends. Hi Monica, wow they are lovely! thanks for sharing! Thanks for the great instruction video! What a great idea this is!!! Oh what a fabulous idea Mon... Definitely one to be CASED.. you are such an inspiration!! As well as the giver of the largest giggle during this blog hop... yes I did read on to your convention report..... I have a funny story about those towels too!! But that's for another day...... See you in December!! Greetings from Aibonito, Puerto Rico!! I will definitely do my sachets this year!! Congratulations for so original and beautiful project.